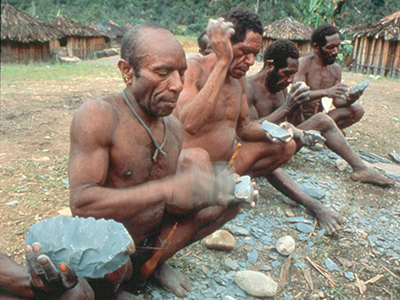 Above: Men of Irian Jaya (New Guinea) continue to make and use stone tools. How can studies of modern traditional stone tool-making humans help us to interpret the prehistoric past? Today there are only a few human groups in the world that still retain robust systems of traditional stone technology, as over the past six millenia metal has gradually replaced stone as the principal material for many tools. 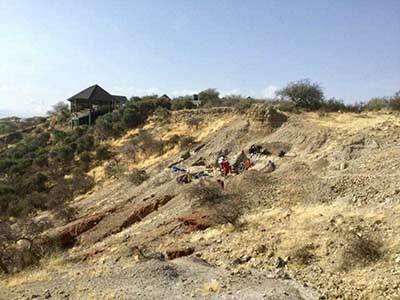 Studying these last vestiges of a two-and-a-half million year Stone Age legacy can yield important insights into the intricate system of knowledge of techniques, procedures, and raw materials that supported stone tool technology for so much of human prehistory. Stone Age Institute researcher Nicholas Toth, with Advisory Board members J. Desmond Clark and Giancarlo Ligabue, initiated a pilot study in 1990 of traditional stone adze-makers in Irian Jaya ( New Guinea). More recently, Stone Age Institute researcher Dietrich Stout conducted a more detailed study of these tool-makers. This research has documented the complexity and intricacy of this tool-making tradition, identified diverse stages of manufacture and patterns of discard on the landscape, investigated the local classification of raw materials and terminology related to stone technology, and assessed the different levels of skill in apprentices and experts.